A fire which broke out Wednesday night in the hills above Prosser is now 80 percent contained. Residents of Prosser, Washington, were told to prepare to evacuate last night as fire spread in the hills above the city. About 150 firefighters worked all night to fight what is now being called the Montecito Fire which erupted Wednesday evening. The fire has burned more than 25-hundred acres. 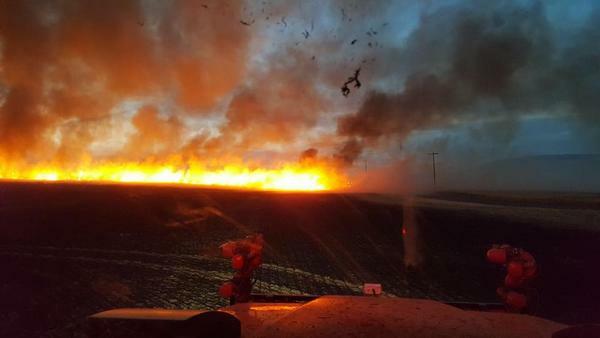 As of early Thursday morning, firefighters are reporting it was 80 percent contained. After a Level Two evacuation order was out in place, some residents had to leave their homes briefly, but the order was lifted as of 4:30 a.m. Thursday. The fire is burning in a mix of cheatgrass, sagebrush and ripening wheat in the steep hillsides of Horse Heaven Hills. The cause is still under investigation. Local firefighters from four surrounding communities have been called in to fight the fire. Strike teams and a state command team will be taking over this morning. Prosser is a small, largerly agricultural community with crops like wine grapes, tree fruit, wheat and hops.